World War II Heritage Days at the Dixie Wing of the CAF is always a colorful and nostalgic event. Nu- merous reenactors appear in authentic regalia looking like they walked off a motion picture set. Reenactors go to great expense to acquire the necessary uniforms that are historically accurate in every detail. For example, a Focke Wulf 149 Pilot appeared in a Luftwaffe uniform complete with the Iron Cross, Luftwaffe wings and all the appropriate accoutrements of a World War II Luftwaffe pilot. Another gentleman has a Wehrmacht uniform complete with Iron Cross, swagger stick and all accoutrements. The German reenactors were very organized and very convincing. Their Allied counterparts included representatives of the United States Army, the United States Navy and various and sundry components of the British military forces. One gentleman appeared in U.S. Navy attire both in a khaki day uniform and in the white dress uniform. Still another gentleman appeared dressed as Douglas MacArthur complete with stars and braided cap and a corn cob pipe. There was a re-enactment of a battle in Italy in 1943 which, in this case, was won by the German forces. There was also a reenactment of a battle between the Japanese and the American forces in the Pacific. There was a very professional demonstration on how the members of an American bomber crew would prepare for a mission. Not only would each member of the air crew have a parachute and an oxygen mask and a flak vest and a flak helmet, but he would have an oxygen bailout bottle in the leg of his flight suit good for 30 seconds. The reasoning behind this is that bailing out at 30,000 feet, one would likely be unconscious in the ab- sence of oxygen. So, there was 30 seconds of oxygen for the airman to employ to free fall from the aircraft until he arrived at a lower altitude where there was sufficient oxygen to maintain consciousness. While in the aircraft, the crew member would be plugged into the oxygen system aboard the aircraft. But if he had to bailout, he would disconnect from the aircraft oxygen system and connect to his bailout bottle and hopefully get out of the aircraft and descend to a lower altitude before pulling the ripcord. Besides the small bailout bottle in the pants leg, there was a three minute bottle that personnel like the bombardier would employ to leave his station, arm the bombs and then return to his station. Besides the educational aspects of the events, there were a number of vendors of World War II memora- bilia including flight jackets, flight helmets, goggles, uniforms, old parachutes, and a whole host of artifacts em- ployed during World War II. For example, you could buy a World War II flight helmet complete with earphones and throat mike for $200.00. Of course, there is no guarantee the system presently works. The microphone/ headphone jack for the World War II flight helmet is not the same as the jacks we currently use in aircraft and would require an adapter in the event the headphones and throat microphone in the aircraft actually work. The highlight of World War II Heritage Days besides the reenactors, the simulated battles and the educational programs is the evening dinner dance. The evening dinner dance featured the Peachtree Jazz Edition. The band plays hits from the ‘40’s including Begin the Beguine, Pennsylvania 6-5000. In addition to a series of swing songs popular in the ‘40’s, one young lady gave a heartfelt performance of There’ll Be Bluebirds Over the White Cliffs of Dover, followed by a trio singing God Bless America. These were very moving and emotional performances bringing the crowd to its feet upon the rendition of God Bless America. Everyone sang along with the trio during the rendition of God Bless America. While there was swing music and swing dancing and patriotic music in the hangar, outside a number of the reenactors were dressed in formal military attire including the German contingent that had a group photograph by the F4U Corsair. 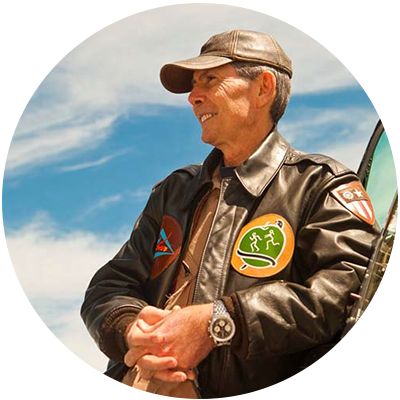 The photographs that accompany this FlightWatch will give you an appreci- ation for the care and detail taken by the reenactors to appear authentic in every respect. Jack Van Ness in his Zero replica, Tony Stein in the SBD Dauntless, and the undersigned in the rep-lica Nakajima Type 97 Kate attack bomber made flyovers at altitude followed by a 360 degree overhead ap- proach to give the audience some appreciation for the flying aspects of World War II operations. The fly overs were fun, and the crowd certainly enjoyed them. While we at the Dixie Wing have assembled a number of World War II aircraft and have quite a col- lection of memorabilia in our Museum, the World War II reenactors with their uniforms, jeeps, machine guns and other artifacts make the weekend of this celebration a real tribute to those that gave their lives that we might have the freedoms we enjoy today. If your schedule permits in the Spring of 2015, you might con- sider paying a visit to the Dixie Wing of the Commemorative Air Force to observe World War II Heritage Days. It really is a blast!